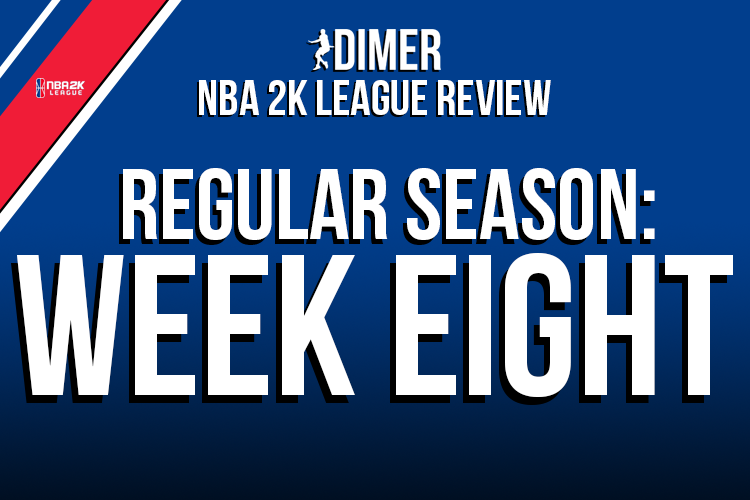 If you’ve been living under a rock, you may not have heard that there was a new patch introduced to the NBA 2K League before week eight. With it came both a threat to the status quo and a welcome-back party for certain aspects of previous metas. What it has created is a lot of uncertainty as we head into THE TICKET and the final four weeks of the regular season. It’s anyone’s game. Here are four takeaways from an interesting week eight. For now, anyway. With a myriad of improvements (a new Dimer badge, a gold Posterizer badge and increased midrange shooting ability), The Shot-creating Slasher made its way back into the league meta with the new patch. Not every team decided to run it. But the teams that did, reaped some mighty benefits. Boo Painter had the league’s second-ever triple-double and the 5-Out was back in full force for some of the teams running their offense through the archetype. Should you be already tired of the archetype’s return, the good news is that last time the Shot-creating Slasher was heavily used in the meta, it was solved within a week or two. There’s no guarantee that will be the case this time around as the archetype is much more effective, but you can bet that teams will be spending a lot of time trying to figure out how to stop it. And just a few hours before this article was published, players on Twitter confirmed that the “stiff arm” animation was banned by the league. Note that means it wasn’t actually removed from the game. Players will just be prohibited from using it at the risk of fines, suspensions or even forfeits. That’s likely to cause a major dent in how many teams will use the Shot-creating Slasher, but the consequences of that ban can’t be written about in one blurb, so we’ll just have to see how it shakes out for now. And if you claim to know, you’re a liar. Five teams currently stand at a 5-4 record (Mavs Gaming, Wizards District Gaming, Jazz Gaming, Heat Check Gaming and Magic Gaming) with another team (CLTX Crossover Gaming) at 5-5. Those six teams occupy spots five through ten in the standings, meaning some good teams are going to be left out come playoff time. It’d be foolish to count out other teams, as well. At 4-6, Grizz Gaming and Raptors Uprising have an outside shot, with the 3-5 Pacers Gaming also standing a chance at sneaking in. With this new patch, anything is possible. Again, with this new patch, anything is possible. Bottom-of-the-standings Knicks Gaming took down 76ers Gaming and Warriors Gaming finally broke through in their victory over Mavs Gaming. You can expect to see more of this the rest of the season. It’s especially important to note as we head into THE TICKET, where the winner will get a guaranteed bid to the playoffs. All it takes is an upset or two for a team near the bottom to pull one out and be playing meaningful games in August. Last week I finally declared two teams, Knicks Gaming and Warriors Gaming, out of playoff contention even if they weren’t mathematically eliminated. This week I feel it’s time to do the same. While Kings Guard and Bucks Gaming both had their moments where they looked to be threats to make it into the top eight, both have fallen hard and sit at 3-6. Even with a new patch and still mathematical possibilities to make it in, we have to be honest and say that these teams should start playing for next season and figure out what they have and what they should do moving forward. As always, feel free to screenshot this and shove it in my face should any of the league’s bottom-four teams make a miraculous run and secure a playoff berth (excluding a TICKET win. I’m talking strictly top-eight finish here). The new patch really throws these power rankings for a loop. As always, these aren’t entirely based on a team’s win-loss record. Regular season records are listed first while regular season plus TIPOFF and TURN records combined are listed in parentheses. They got a quality win, but they move down because the team below them also got a quality win and looked better doing it. Really nice to see them finally break through and beat a good team after coming so close in the previous two weeks. Yep, they’re all the way down here. Five regular season losses in a row and six overall losses in a row (counting THE TURN) will do that to a team. Broken offense, broken defense and the frustration is obvious. Two losses in a row have pushed them from the brink of playoff contention and back toward the bottom of the league. The same problems that plagued them at the beginning of the season seem to be biting them again. Second-to-last in the standings, but this team looked pretty good with the new patch in their win over 76ers Gaming. It’s a shame that it’s merely a consolation in a lost season. They got in a small forward battle and lost, but there’s just something to like about this team when you watch AuthenticAfrican run things. A close and hard fought win over a Warriors team that was likely full of confidence. If they had only figured things out earlier in the season, this team would have been a tough out in the playoffs. Their first stumble in a few weeks. The game was right there in their hands and they blew it. That’s both a tough loss to take mentally and a potential back-breaker in the standings. There’s a big difference between 4-4 and 3-5 at this stage of the season. This is where it gets real tough to sort teams out because just about all the teams from sixth through tenth have beaten each other at some point. I had this team third in my power rankings just two weeks ago. Two straight losses are enough to drop them this far in such a jam-packed crowd of five-win teams. Need to figure it out if they want a playoff spot. Gutsy comeback win against Jazz Gaming. A real threat to make the playoffs after many wrote them off after their TIPOFF performance. The stiff arm ban may not make them look as good as they did against Grizz Gaming, but this team is still talented if a little inconsistent. Tried to take advantage of the new patch and it didn’t work out. I’m not sure if they’ll try it again or go back to what has worked for them. It’s weird to see a team third in the standings with a point differential of -33, but here we are with Pistons GT. Even at 6-3, I’m still not sure what to make of this team and don’t know just how much of a threat they are to truly contend for the title in August. I don’t like to punish teams too much for losing to Blazer5 Gaming, and I have them over Pistons GT because I think this squad has a bit more potential with the new patch considering their personnel. Came very close to losing two games they shouldn’t have, but clutched it in their win over Pacers Gaming. They may have some things to figure out with this new patch. What better way to bounce back from your first loss of the regular season than to beat one of the league’s best teams? Credit this squad for not succumbing to bad form after last week.